Ideas for the Hack | New Super Hacker Bros. Yes we did. But we dont know if we will do that. my suggestion is: have you think on edit the coin? Hmmm maybe we will do one, but I dont really like them. And yes, we edit the coin, too. And about the BG’s, we dont know. ¿Por que no editas un nivel y pones un laberinto gigante? I’m sorry, we cant speak spanish. But Google-Translator says something with making a maze. What do you exactly mean with this? Can you explain it better? Why do not you edit a level and put a giant maze? How about editing the koopa? 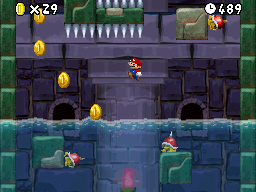 I’ve looked at how mario is on the DS and how he is in Galaxy. largely the same, but the colors on him in galaxy are more vibrant. so i think you should heighten the saturation on mario and luigi’s texture!